Helping a child who has been through a traumatic experience such as physical and sexual abuse or neglect takes guts. It’s real and it’s raw. Your child’s experiences have shaped how he or she acts and responds to the world around them. Their experiences can create coping behaviors that cause disruption and chaos. The National Child Traumatic Stress Institute states that a child with a complex trauma history may be easily triggered or “set off” and is more likely to react very intensely. The child may struggle with self-regulation (i.e., knowing how to calm down) and may lack impulse control or the ability to think through consequences before acting. Many times, we react with quick responses and impatience. As a parent to child who has been through abuse and neglect, your approach to your child’s behaviors needs to be intentional and full of understanding. 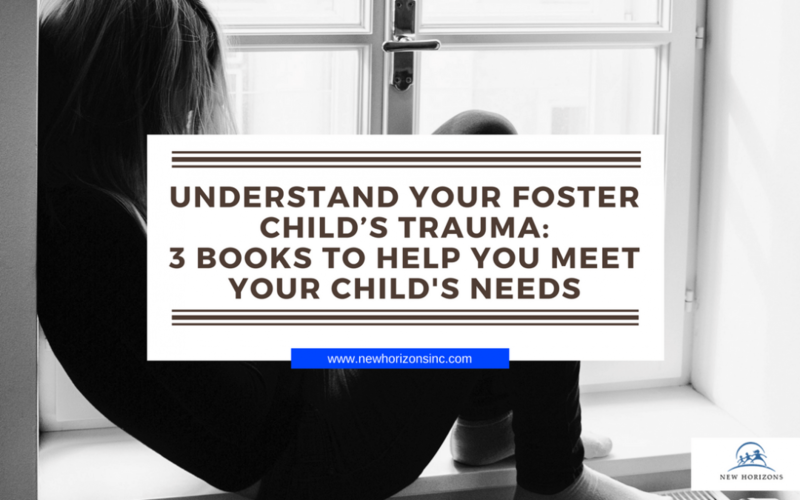 Reading through these books will allow you to look at your child from a more compassionate and loving perspective. Each book can be read all at once or used as a reference to look back on as you learn more about your child. The Connected Child is based on Trust-Based Relational Intervention (TBRI), an attachment-based, trauma-informed intervention that is designed to meet the complex needs of vulnerable children. It provides practical advice and techniques. Purvis focuses on building bonds and trust with your child. The book provides real-life situations of how a child may act and examples for positive responses. She addresses topics such as defiance, finding the right balance, and offering choices and compromises. Trust-Based Relational Intervention is used by many professionals and organizations who work with children (including New Horizons). This book explores real-life stories of children who have been through extreme abusive situations. 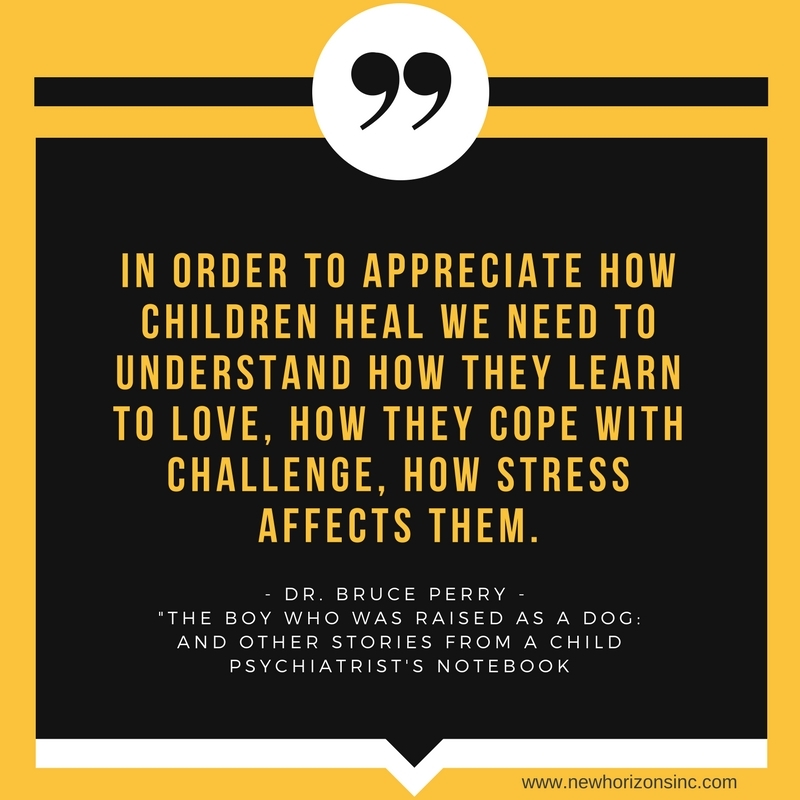 Dr. Bruce Perry is a Child Psychiatrist and founder of The Child Trauma Academy. Perry has helped many children who experienced horrific abuse find ways to cope and heal. Be prepared to shed a few tears reading this one. Then think about your own child. Perry’s focus is on total brain development and nurture. Children who have experienced traumatic events like abuse may miss vital developmental stages. The behaviors your child is displaying can be the same as the stage they missed. For example: If your 10 year old starts displaying the same behaviors you typically see in a 3 year old. Your 10 year old may have had important nurturing needs go unmet when she was a 3 year old. From the book: Perry shows how simple things like surroundings, affection, language, and touch can deeply impact the developing brain, for better or for worse. Dr. Books and Goldstein provide practical advice for raising children who are resilient, emotionally healthy children. The authors provide a question and answer format with answers to the thousands of questions they have heard from parents throughout their workshops and seminars. From the book: They discuss such important topics as helping children feel special and appreciated, teaching children how to solve problems and make decisions, and encouraging self-discipline, self-control, and interpersonal skills. One neat aspect of the book is the outline of solutions listed by topic or the “Quick Solution Finder”. Is your child dealing with anxiety? Are you trying to teach your child about empathy? You can skip ahead to a specific topic to address exactly what your child needs. While a book will never teach you how to handle each situation, these books will provide you with a road map to approach your child with nurture and care. There may be times when you are your child’s only chance. Give her the opportunity to grow emotionally, build self-worth, and succeed.